Taco Night deserves an inspired cake. When I think Mexican, somehow... margaritas come to mind. And when that happens, all I can think is lime. Lime Cheese Cake sounded amazing this week...but what to pair with it? Reviewing the many flavors that easily pair with lime was easy: cherry, lemon, vanilla, raspberry,... and then I arrived at blackberry. It sounded perfect. I went looking for other lime and blackberry combinations and found very few examples. That's ok, I don't mind practicing. Starting with the Blackberry Cake seemed like the best jumping-off point. I followed my Strawberry Cake recipe, switching out strawberry puree for blackberry. It was good, but not enough blackberry kick. 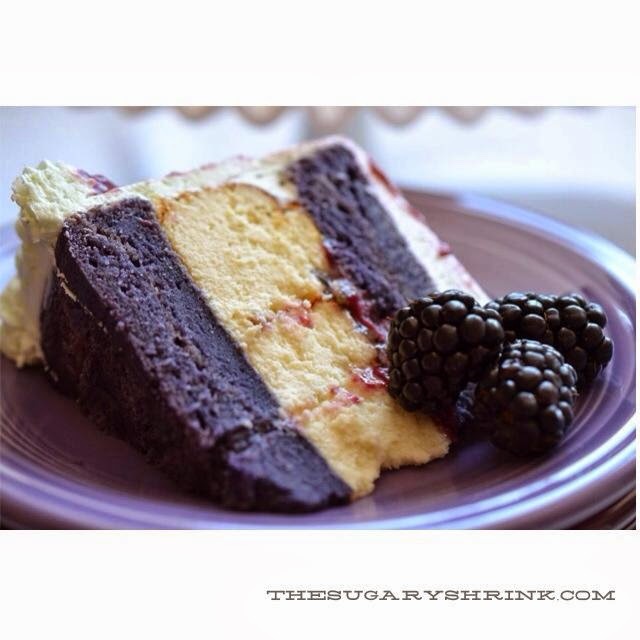 In the end, I used 2.5 cups of blackberry puree (pressed through a sieve to eliminate seeds) and added Wilton's Violet coloring gel to achieve a luscious dark color. The texture of the cake is wonderful - it's quite moist and spongy and strong. I didn't rise hardly at all, so maybe I need to fiddle with the baking soda and baking powder ratio. As is, it's quite delightful but fill the pans to desired height. I had enough batter left over to bake 16 cupcakes. Cheese Cake is such a treat! I followed my favorite and easy go-to recipe and added lime zest and lime concentrate. Afraid of going overboard, I didn't quite add enough to this cake. I'd rather err on the side of too light instead of too heavy. The Blackberry Curd was simple to put together....after I got all the blackberries through the blender and then the sieve. I swear - I thought my arm was going to fall off! This particular curd recipe makes a very thick product - perfect for filling tarts or folding into heavy cream for a berry short cake. It's quite delicious. Building this cake was terrific. The cheesecake was a bit sunk in the center. Instead of trimming it, I decided to fill that shallow well with Lime Marmalade and Blackberry Curd. Since the cake layers were thinner than planned, I wasn't about to trim anything away. 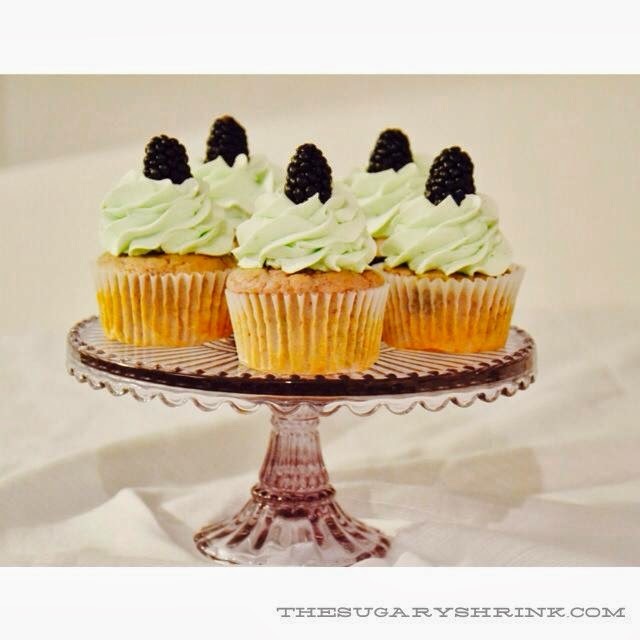 Earlier in the week, I had baked a few cupcakes and whipped together lime buttercream. The feedback was, "Yummy" ... "Up the blackberry and increase the lime just a wee bit." So that's what I did with the buttercream. I was happy with the results. All went well until the Blackberry Curd started shifting. Without any type of doable repair (I could have wiped the entire cake clear and started over from the crumb coat), I waited for the slow, gravitational win of the curd to finally stop. And when it did, it wasn't that terrible. I was able to find a spot that I thought would photograph well. I'll take that. Nothing about the way I approach baking or cake construction is ever perfect. That's life - sweet and sometimes messy. Since this cake was for an event at our house, Yeah! for Taco Night, I have myself permission to slice it well ahead of the event so I could get a snapshot or two with the natural light. Feedback from our youngest who ate the slice, "This is a good one." I'll take that. This cake had several moving parts and rather pricey ingredients (why couldn't I wait until blackberries were in full swing? ), and I'm happy with the results. Despite individual components that weren't what I planned...the end product is quite delightful. And after all this, I'm grateful for my life partner. And sobriety. And our people.